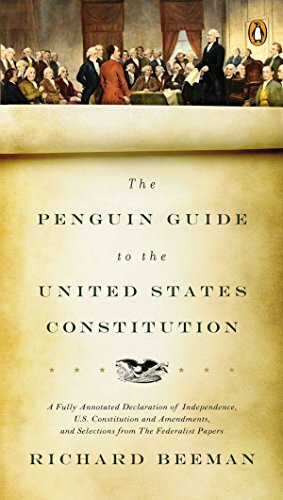 [PDF] The Penguin Guide to the United States Constitution: A Fully Annotated Declaration of Independence, U.S. Constitution and Amendments, and Selections from The Federalist Papers | Free eBooks Download - EBOOKEE! Description: A unique and handy guide to the law of land from one of America's most esteemed constitutional scholars. Known across the country for his appearance on The Daily Show with Jon Stewart, Professor Richard Beeman is one of the nation's foremost experts on the United States Constitution. In this book, he has produced what every American should have: a compact, fully annotated copy of the Declaration of Independence, the Constitution and amendments, all in their entirety. A marvel of accessibility and erudition, the guide also features a history of the making of the Constitution with excerpts from The Federalist Papers and a look at crucial Supreme Court cases that reminds us that the meaning of many of the specific provisions of the Constitution has changed over time. No comments for "[PDF] The Penguin Guide to the United States Constitution: A Fully Annotated Declaration of Independence, U.S. Constitution and Amendments, and Selections from The Federalist Papers".